(Bloomberg) -- Want to receive this post in your inbox every afternoon? Sign up hereOne of the grandest European monuments to faith, and one of the most visited sites in Paris, was severely damaged as fire raced through the Notre-Dame cathedral less than a week before Easter. Special Counsel Robert Mueller’s report on allegations President Donald Trump’s campaign colluded with Russia to fix the 2016 election will be released this week. How much is redacted by Attorney General William Barr, whose impartiality has been under fire, remains to be seen. Some Democrats have raised the specter of a White House coverup. Trump won the presidency with the help of rural America. Now, farmers and their lobbies are starting to worry Trump may throw them overboard in the name of ending his trade war against China. The president got some good news from Goldman Sachs: The bank thinks he’s more likely than not to win re-election in 2020. Trump received some bad news, too. A large majority of Americans think his claim to have lowered their taxes—and not just those of the rich and corporations—is fake news. Trading manipulation is rampant on certain cryptocurrency exchanges, according to researchers at several universities. Billionaire Jack Ma keeps telling tech workers they should work six-day weeks, 12 hours per day, defying a growing social media backlash. What’s Joe Weisenthal thinking about? The Bloomberg news director says his joke last year about Tiger Woods, and how the golfer’s success on the links could augur well for markets, may have been right. Mass production of Apple iPhones will soon begin in India. The $18 billion electric car bubble is about to burst in China. See how cars in vending machines made these men billionaires. Five charts that show the economic chill gripping Dubai. Researchers just printed out a 3D heart from a patient’s own cells. Nike to Tiger Woods: Thank you for the $22 million. After a 60,000 percent rally, America’s top stock has gone cold. This Portuguese pastry is taking over the world. An unlikely dessert is on its way to becoming as ubiquitous as the croissant. 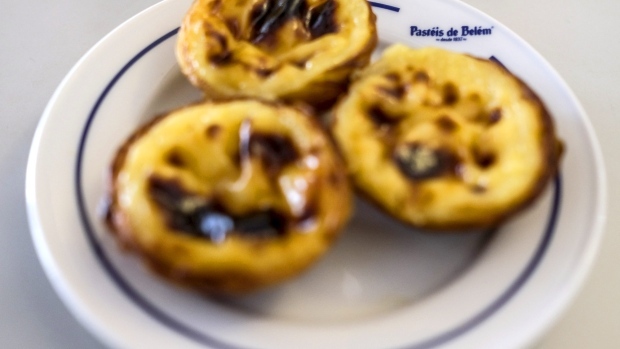 Not long ago, an authentic pastel de nata required a trip to Portugal. But now they’re popping up in supermarkets, coffee shops and bakeries from Manhattan to Singapore. The pastry even earned its own episode on the Great British Bake Off. It has arrived.